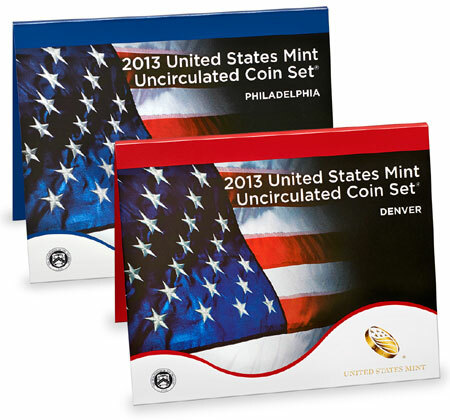 On June 4, 2013, the United States Mint began accepting orders for the 2013 Uncirculated Coin Set. This represents one of the Mint’s most popular annual offerings, which provides collectors with the opportunity to acquire an array of different uncirculated quality coins in a packaged set. These coins are struck on special presses using greater force than circulating coins, producing a sharp, intricately designed image. For this year, the Mint has redesigned the folders, which now display a red, white, and blue flag image on the front. The Philadelphia folder is accented in blue, while the Denver folder is accented in red. The inside cover of each folder contains coin specification information and a certificate of authenticity. The 2013 United States Mint Uncirculated Coin Set is priced at $27.95 each. There are no stated mintage or household ordering limits in place. For the uncirculated set to be complete, the Mint should have included the five 2013-S uncirculated quarters. Although these quarters are available only from the Mint’s website, the same holds true for the P and D Kennedy halves as well as Presidential and Native American dollars, all of which have been included in the Uncirculated Set.